In August 1967, I was the Sergeant Engine Fitter in charge of the engine change on XL150 at Loc Nhin Vietnam. This was challenging to say the least, given the mud, the lack of ground equipment, and the threat of attack by VC and NVA forces, which led to the engine change team being forbidden to remain on site after dark. 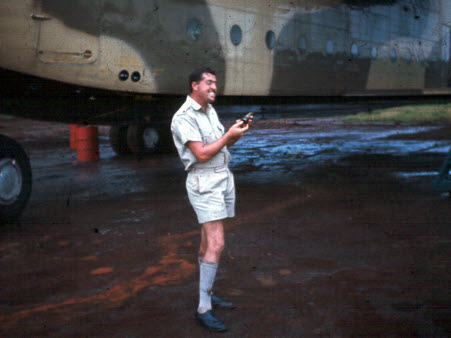 We had to fly up from Saigon in the Air Attaché’s Devon every morning, and return every night. Due to these handicaps, the engine change took almost a week! Because of the imminent attack, and the fact the the Bev was partially blocking the runway (for all but very short landing types) we were authorized to destroy the aircraft, if we were unable to recover it. It was touch and go for a while, but we finally managed to complete the job and fly it out. The pilot on that occasion, Squadron Leader Max Bacon, was later killed when the same aircraft crashed in Malaya. The special forces base at Loc Nhin was overrun soon after we got out, with major casualties on both sides. 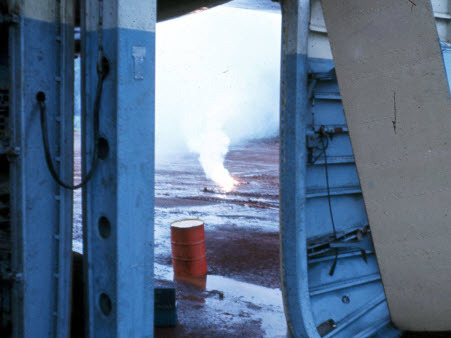 Among the other difficulties we encountered whilst at Loc Nhin, the US Special Forces detachment were blowing up excess ammo in preparation for abandoning the fort. ABOVE LEFT: They got a little over-enthusiatic, to the extent that the Beverley was almost destroyed by accident! Following one extremely loud explosion, burning debris and shrapnel fell on all sides of the aircraft, and a 155mm nose cone landed in the mud only a couple of feet from Sgt. Pete Ryan. BOVE RIGHT: Brian Whitehead standing beside XL150 with the nose cone of a 155mm shell.